Tour d’Midwest, Day 9: Is This Heaven? 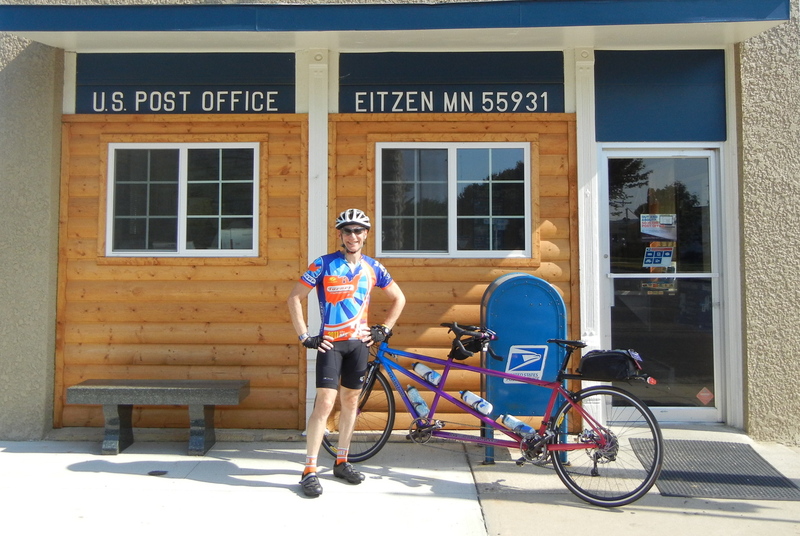 The post office in Eitzen, Minnesota, just to prove we were there! We are almost 950 miles from home, the furthest we will get. Today’s ride starts in Iowa in the northeast corner and goes into Minnesota. People always ask us if we have ridden RAGBRAI, which is the ride across Iowa. 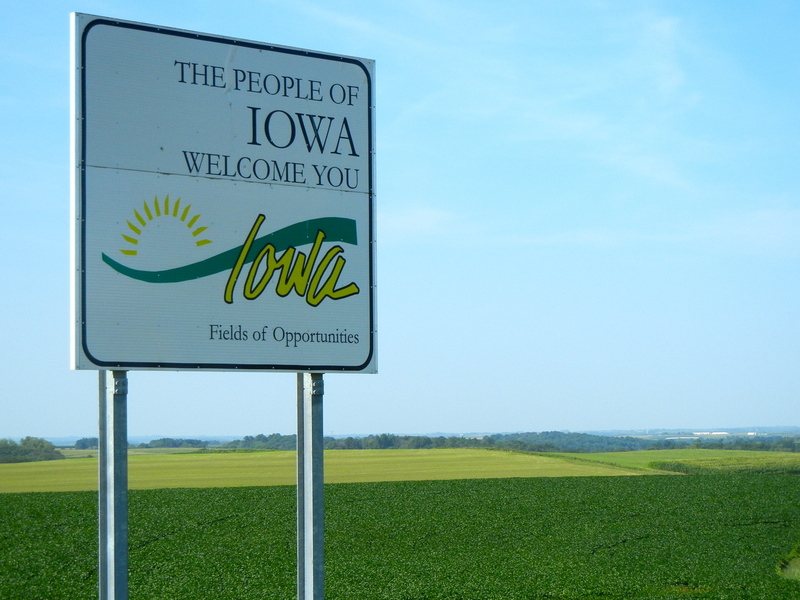 We always say no, but now we can say that we have ridden in Iowa. More pigs than people in Iowa. 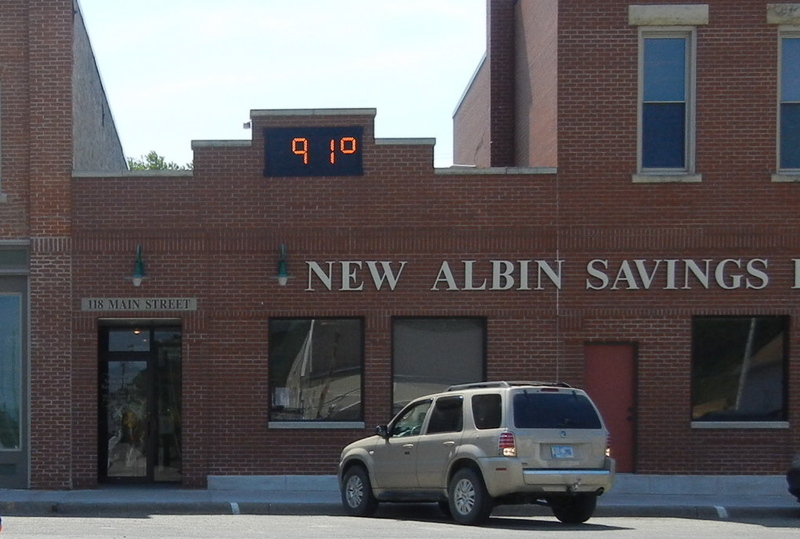 It’s warming up in New Albin, Iowa when we start at 8:30AM. 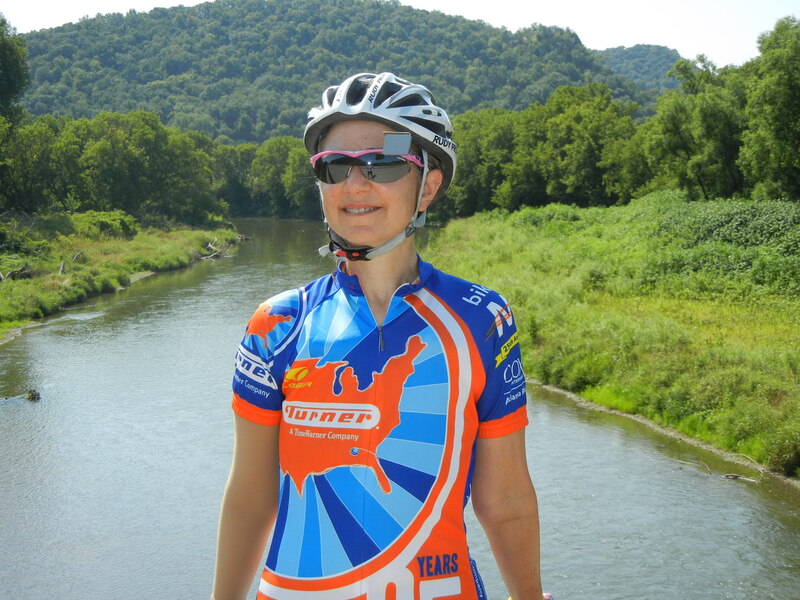 Because of the temperatures and the wind, we cut our 53-mile ride down to 34 miles. It’s the ninth day in a row that we have ridden, so we don’t feel too bad about cutting it short. We immediately start with an 9% uphill that goes for about a mile. 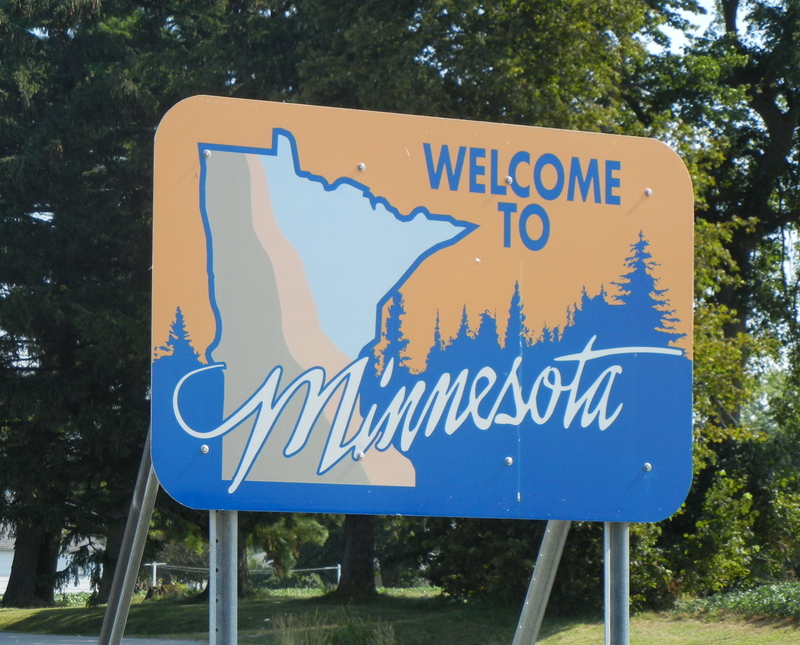 As we cross the Minnesota border, this turns into a nice plateau, but the breeze you heard about earlier is a 20 MPH headwind. After one hour, we have covered less than 12 miles and our legs are hurting. Eve on the Iowa River. The cursed headwind turns into a tailwind and we cover 20 flat miles along the Iowa River in the next hour. When we finish, it’s getting pretty warm. 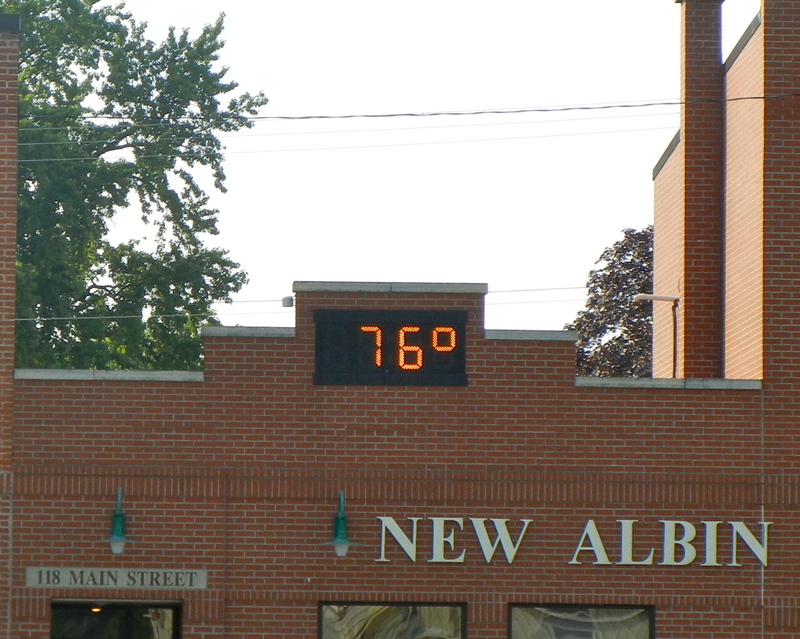 Don’t worry, it got up to 100 today. Now that our hot ride is over, it’s time to turn our attention to cold beer. We cross the Mississippi River back into Wisconsin. We are headed for Potosi, home of the National Brewery Museum and the Potosi Brewery. 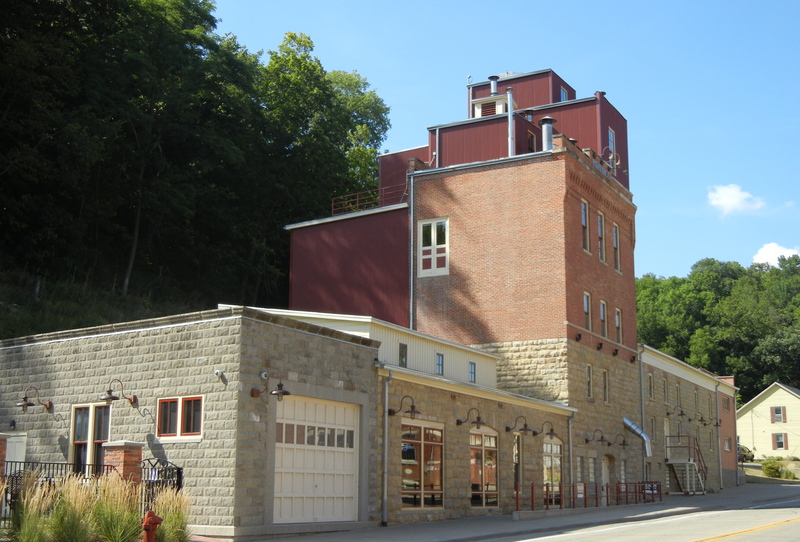 The beautifully restored Potosi Brewery. 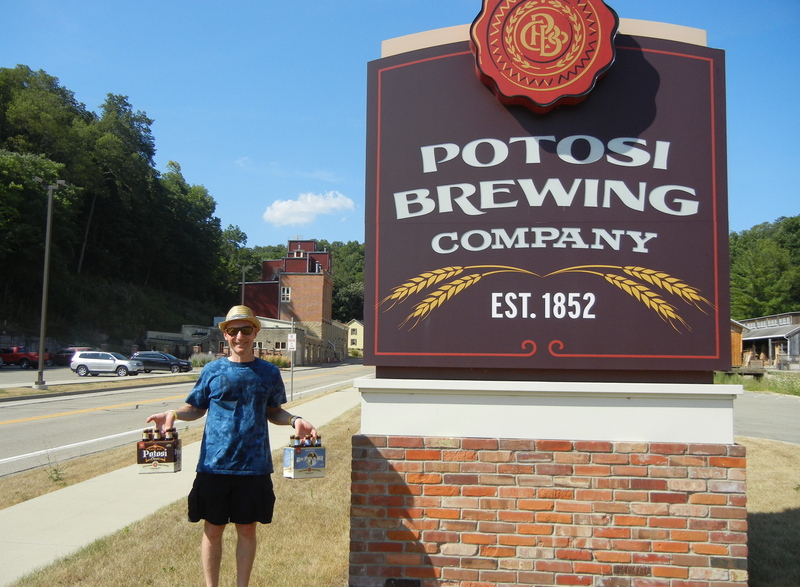 Potosi started making beer here in 1850 and made it until 1972. The building fell into disrepair, but reopened in 2008 with a restaurant, brewery and the National Brewery Museum. When we heard about this place, we had to investigate. Lunch was good. We had not had pretzels for 5 days, so we checked theirs out. 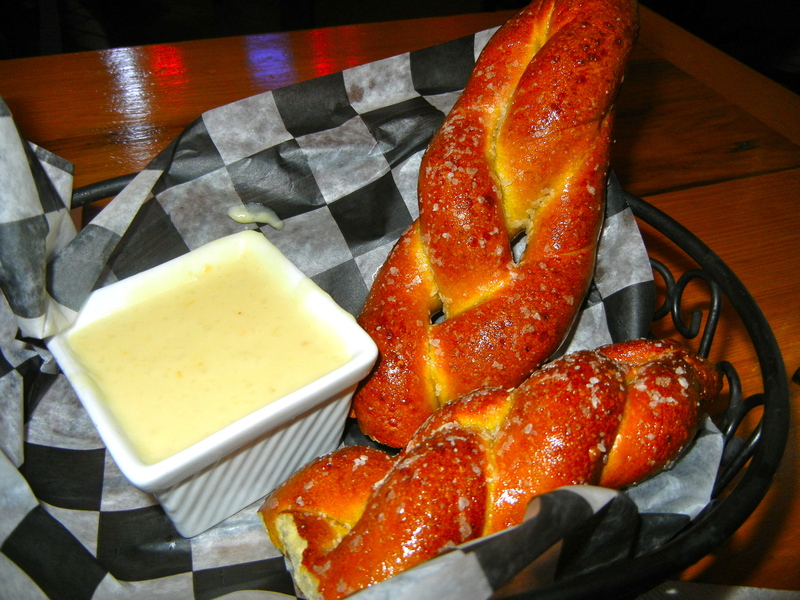 Buttery, soft pretzels with a beer-cheese dip. 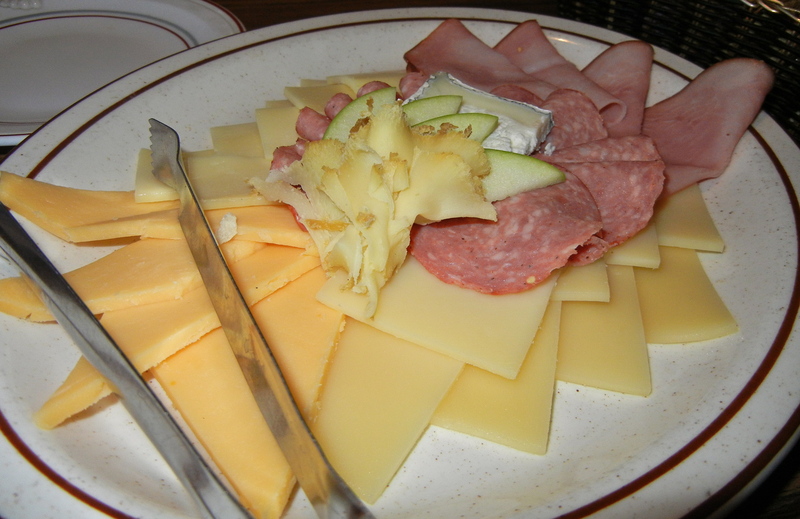 Great appetizer. Of couse with pretzels, you must have beer. Don’t worry–they are only four ounces each. The wheat beer was our favorite. And then we have our lunch. 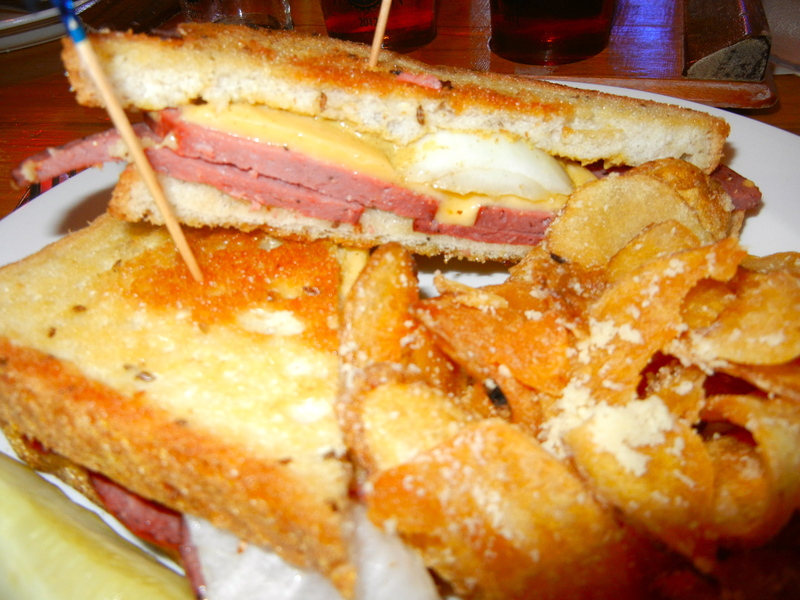 Summer sausage sandwich on grilled rye. 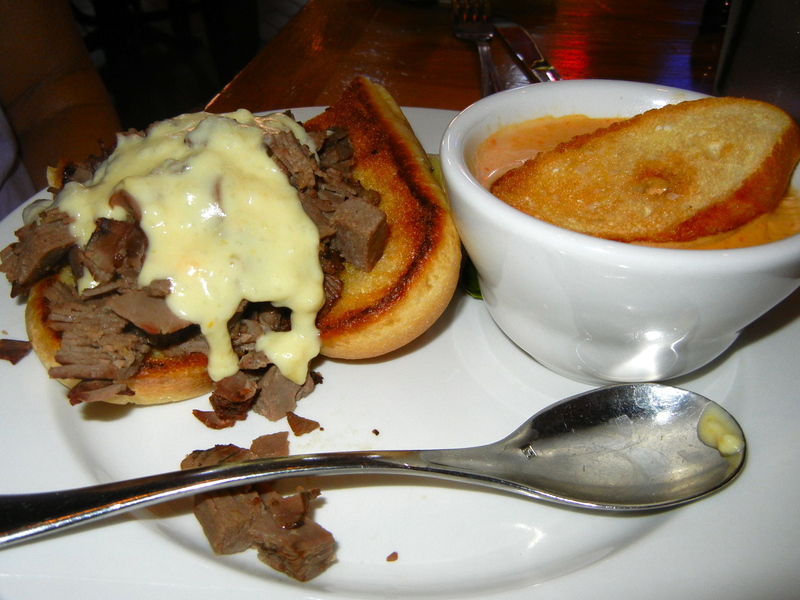 Philly cheese steak with beer-cheese soup. 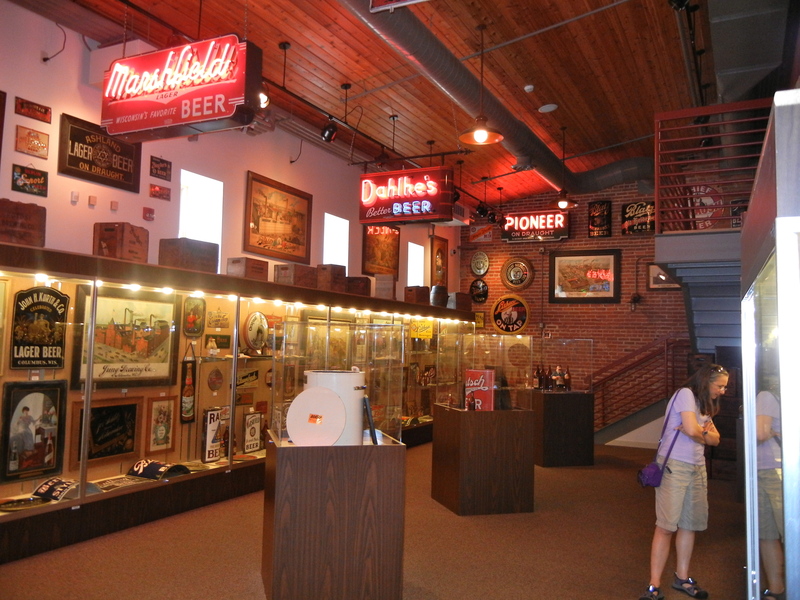 The Brewery Museum is fun as well. There are many different displays from local and national breweries. Part of the over three floors of beer displays. Some are still around, most are not. We relived our childhood with some of the “beers of our fathers” that are no longer made. 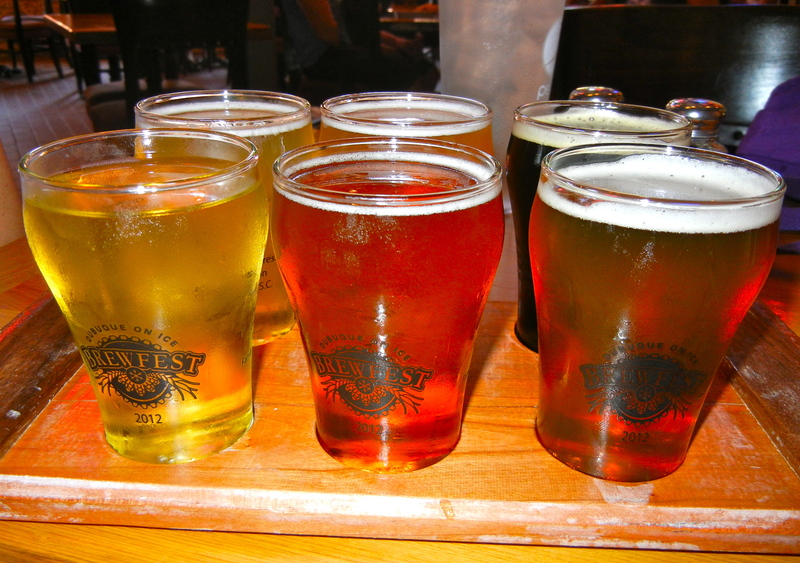 Here’s a tip if you go: with any beer glass, t-shirt or museum entry, you get a free beer at the restaurant. We didn’t figure that out until after we ate, so we didn’t cash our beers in because we had to drive. Tourist with beers not available in Atlanta. Our next stop is New Glarus, which is our last stop in Wisconsin. It’s a town that looks like a Swiss village. It’s not a fake village like Helen, GA, but a real one that was settled by the Swiss in the 1850’s. We’ll post some pictures in tomorrow’s entry. 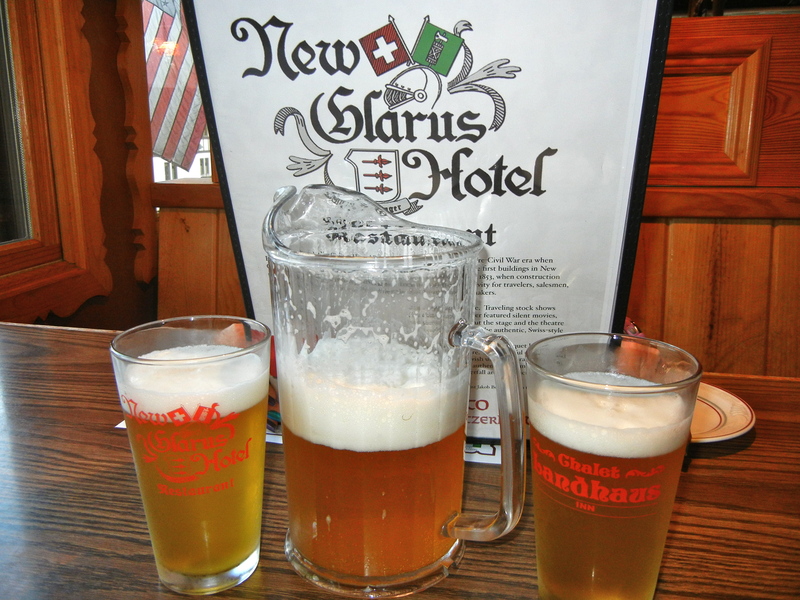 For dinner, we eat at the oldest building in town, the New Glarus hotel. New Glarus beer is made a few blocks from the New Glarus hotel. The Spotted Cow is their wheat beer. 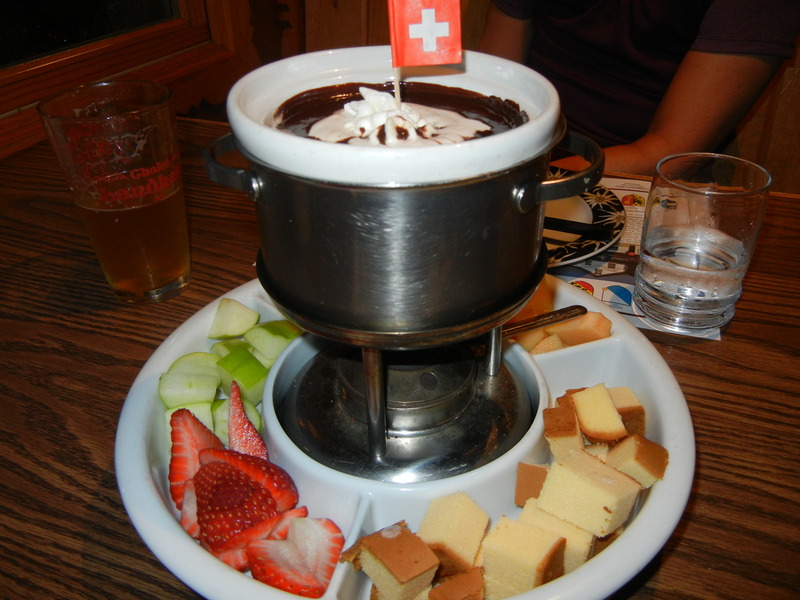 Chocolate fondue. When in a Swiss village, eat like the Swiss! As we were leaving, Karen, the manager of the restaurant, insisted that we try the peach frozen yogurt. What a nice lady! Thanks for the taste, Karen. It was delicious!